U.S. President Donald Trump said in a string of early Saturday tweets that the Federal Government shutdown was a “gift” from Democrats to mark his first anniversary in the office. Trump also laid the entire blame of the stalemate at the doorstep of Democrats whom he accused of obstructing measures to keep the government running and pushed for more Republicans to be elected into congress in 2018. The 45th president of the U.S. was inaugurated on Jan. 20, 2017, after defeating arch-rival Democratic Hillary Clinton by Electoral College in the Nov. 8, 2016 poll, but lost the popular votes to her. Trump said: “Democrats are far more concerned with Illegal Immigrants than they are with our great Military or Safety at our dangerous Southern Border. “For those asking, the Republicans only have 51 votes in the Senate, and they need 60. That is why we need to win more Republicans in 2018 Election! The shutdown followed the inability by Republican and Democrats senators to reach a compromise on the Obama-era Deferred Action for Childhood Arrivals (DACA) programme that gave protection to about 800,000 undocumented children and building a wall along the U.S.- Mexican border. In the situation, Federal Government employees would be forced to shut down nonessential services while essential staff at top level agencies would continue working but employees are not sure when they would get their salaries. A government shutdown could last for days or weeks as long as it takes Congressional leaders from both parties to reach an agreement to fund the government, but not months. A temporary spending bill was passed in the House of Representatives on Thursday night with 230 to 197, but a concurrent 60 votes was required in the Senate to advance a short-term spending bill to fund the government and avoid a shutdown. Consequently, the final vote in the Senate as at midnight ended 50 to 49, for and against respectively, short of the required 60 votes in order to break a filibuster, while Sen. John McCain was absent. Senate Majority Leader Mitch McConnell also laid the shutdown at the Democrats’ feet, blasting Democrats from the Senate floor where he said the shutdown “was 100 per cent avoidable”. Vice President Mike Pence in a statement also criticised the Democrats, saying: “Our administration worked in good faith to put a bipartisan deal on the table that would strengthen our borders, end chain migration, eliminate the visa lottery, and deal compassionately with DACA. “But rather than solve problems, Democratic leadership preferred a shutdown that has dangerous consequences for our national defense. Their action tonight- or lack thereof- is unconscionable”. 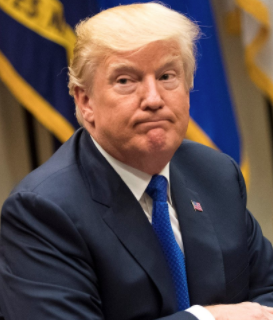 The post Trump says shutdown a ‘gift’ from Democrats appeared first on Vanguard News.